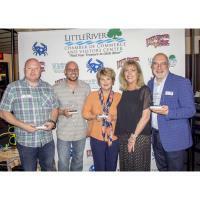 Little River, SC - The Little River Chamber of Commerce and Visitors Center held their Annual Dinner Meeting on Thursday, March 14. In addition to some words about recent successes, they also made spoke about the future of Little River, and surprised some well-deserving businesses with their awards. The Emerging Leader of the Year recognizes a community leader aged 40 or younger. The chamber was proud to present this award to Don Kettner of Crab Catchers. Don is a co-owner of Crab Catchers and has made great strides in expanding the business and providing new events at the Little River waterfront to attract a new audience to the area. The Mary Martin Community Service Award recognizes a non-profit organization that has exceptionally served the community, and was awarded to Teen Angels of NMBHS. Renee Hembree found a need in our community and took action, creating an organization to help the youth in our community who have no one to reach out and give them a hand up. The Citizen of the Year recognizes an individual who has displayed outstanding service or significant impact in our community. This was awarded to Ron Wilson of the Veteran's Welcome Home & Resource Center, who has been vital to their recent successes and put in hundreds of volunteer hours to ensure this organization remains a resource to our veterans - from Little River to Georgetown. The Member Business of the Year recognizes a business that has exemplified their commitment to the Little River Community. This award was received by Matt Sedota of Easy 105.9. Their contributions in promoting our community have really put us on the map in the Grand Strand. Our primary objective is to make the Little River area an even better place to live, work and play. The Mission of the Little River Chamber of Commerce is to Promote Community Improvement, Tourism, and Commerce by Proactive Leadership and Community Involvement. The Little River Chamber of Commerce is a membership organization supported by more than 300 businesses and nonprofit organizations, and we offer benefits and services of value to businesses of every size and type. In addition to providing numerous opportunities for local businesses to promote themselves to visitors, residents and other businesses we promote our area and businesses through out-of-market tourism, local events, our visitor's center, and online. For more information about the Little River Chamber of Commerce & Visitor's Center's services, contact them at 843-249-6604 or Info@LittleRiverChamber.org, or visit www.LittleRiverChamber.org.